In their paper, researchers described testing two versions of their battery supercapacitor hybrid. 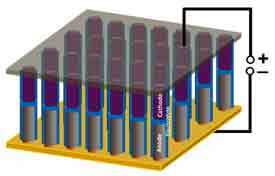 The first is a sandwich with nickel/tin anode, polyethylene oxide (PEO) electrolyte and polyaniline cathode layers; it was built as proof that lithium ions would move efficiently through the anode to the electrolyte and then to the supercapacitor-like cathode, which stores the ions in bulk and gives the device the ability to charge and discharge quickly. The second packs the same capabilities into a single nanowire. The researchers built centimeter-scale arrays containing thousands of nanowire devices, each about 150 nanometers wide. A nanometer is a billionth of a meter, thousands of times smaller than a human hair. Ajayan’s team has been inching toward single-nanowire devices for years. The researchers first reported the creation of three-dimensional nanobatteries last December. In that project, they encased vertical arrays of nickel-tin nanowires in PMMA, a widely used polymer best known as Plexiglas, which served as an electrolyte and insulator. They grew the nanowires via electrodeposition in an anodized alumina template atop a copper substrate. They widened the template’s pores with a simple chemical etching technique that created a gap between the wires and the alumina, and then drop-coated PMMA to encase the wires in a smooth, consistent sheath. A chemical wash removed the template and left a forest of electrolyte-encased nanowires. In that battery, the encased nickel-tin was the anode, but the cathode had to be attached on the outside. The team’s experimental batteries are about 50 microns tall — about the diameter of a human hair and almost invisible when viewed edge-on, Reddy said. Theoretically, the nanowire energy storage devices can be as long and wide as the templates allow, which makes them scalable.